Mel Ramos, Wonder Woman, 1962, Rochelle and Darren Leininger Family Collection. Metropolis can’t be found in Northwest Arkansas. Neither can Themyscira. What can be found there is the Crystal Bridges Museum of American Art and its Men of Steel, Women of Wonder exhibit, opening February 9 and running through April 22. 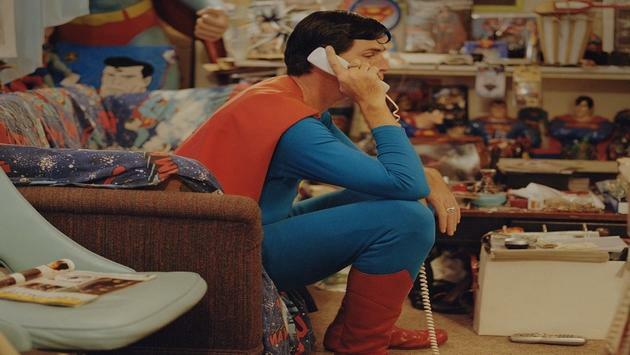 The exhibit, featuring more than 70 paintings, photographs, installations and videos by over 50 artists, examines art-world responses to Superman and Wonder Woman, ranging from their Depression-era origins to today’s contemporary artist interpretations. 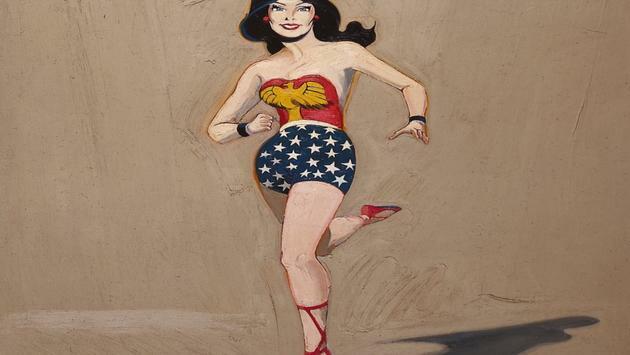 “For decades artists have employed Superman and Wonder Woman in their work because they recognize the power of these characters within popular culture,” exhibit curator Alejo Benedetti said. To generate excitement for the show, the museum launched an artwork into space via weather balloon on January 20. Artist Robert Pruitt’s sculpture Untitled male figure was created specifically for this event. The artwork weighed under three pounds with a dimension of 24 1/4” x 12” x 5 1/2”. : Screenshot via Go Pro camera of Robert Pruitt’s sculpture Untitled male figure (2019). 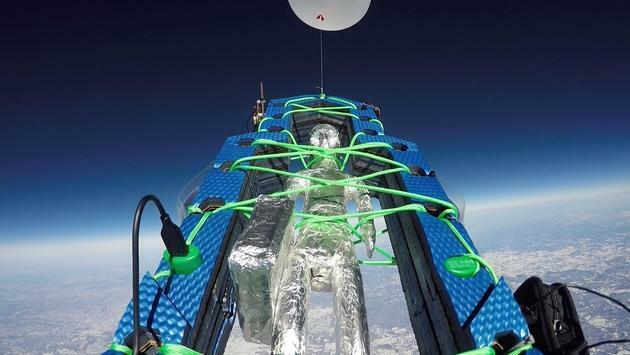 A 12-foot balloon was attached to a custom built frame to house the work, which reached a height of 109,000 feet during its 35-minute flight before falling to earth in the Ozark National Forest, where it was recovered. The piece will be on display in the show. While what Superman and Wonder Woman stand for remains fixed, their portrayal does not. If superheroes aren’t your thing, the Crystal Bridges Museum of American Art offers much more for art lovers in its collection, including Georgia O’Keeffe’s Jimson Weed/White Flower No.1. This historic painting is the most expensive work ever created by a female artist. The museum, founded in 2005 by Walmart heiress Alice B. Walton, purchased it at auction for $44.4 million in 2014. Northwest Arkansas includes the cities of Fayetteville, Bentonville, Rogers, Springdale and Fort Smith. Due to the presence of Walmart and a handful of other Fortune 500 companies based in the area, like Tyson Foods and J.B. Hunt Transport Services, it has a great deal to offer visitors beyond the Crystal Bridges Museum, which boasts a permanent collection far beyond what you’d expect from a city the size of its hometown, Bentonville. Also benefitting the area’s cultural, educational and entertainment scene is the University of Arkansas. With almost 30,000 students and designation as a Carnegie Foundation university, placing it among the top three percent of universities in America operating at the highest level of research, its hometown of Fayetteville draws the best and the brightest from across Arkansas and well beyond. Siri Kaur, Christopher (phone), 2006. Sports fans will enjoy its roster of successful athletic teams competing along with the University of Alabama, Texas A&M, Georgia, Florida and others in the prestigious Southeastern Conference. Daily non-stop flights via American Airlines, Delta, United and Allegiant Air from the regional airport in Bentonville service 15 destinations including New York, Los Angeles, Chicago, Dallas, Orlando and Atlanta. Perhaps the area’s greatest draw, however, is its abundant outdoor recreational opportunities. The Ozark Mountains and numerous state parks provide a photogenic backdrop for activities ranging from the traditional hiking, camping and fishing, to the exotic caving, rock climbing and scuba diving. With everything to see and do in the area, Superman and Wonder Woman might ask to stay.